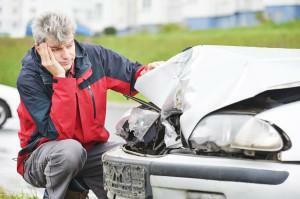 There are many different kinds of vehicle accidents. They can occur on a high speed freeway or a local parking lot. Many of those accidents result in injuries and deaths to drivers and passengers. There were 10.8 million vehicle accidents in the US in 2009, according to the US Census Bureau. Those accidents resulted in 35,900 deaths. The agency estimates that there were 1.1 deaths for every 100 million vehicle miles nationwide, but Georgia’s rate was nearly 69% higher at 1.6 deaths in 2009. These occur when the front of one car crashes into the back of another. It can be caused by sudden deceleration or stopping of the car in front, with the driver behind being inattentive or following too close to stop in time. Injuries to the occupants of the front vehicle are normally more severe. Whiplash is a common injury in rear-impact collisions, even when the accident happens at a low or moderate speed. The driver of the car that rear-ends the other car is normally considered to be at fault unless it’s an unusual situation, like the car in front driving in reverse. In most situations, the driver of the car in behind is held financially liable for damages. These accidents happen when the front of one vehicle hits the side of another. Depending on speed and other circumstances, occupants of the car being hit could suffer severe injuries. Though airbags, seat belts, and other safety devices can lessen the extent of injuries, most of the crash protection in cars is in the front and rear of the passenger compartment. These occur when the sides of two parallel cars touch and “swipe” each other. If both vehicles are traveling in the same direction and the drivers keep control, the vehicles may only suffer cosmetic damage. If vehicles are traveling in opposite directions and scrape up against each other, given the speed and force involved, drivers may lose control and injuries could be severe. If a vehicle flips over onto its side or roof, it’s considered a rollover accident. They are often caused by a sharp turn at higher speeds. All vehicles could roll over, but those with higher centers of gravity (such as trucks and sport utility vehicles) are usually at a greater risk. These occur when the front ends of two vehicles hit each other. Head-on collisions, given the force of two vehicles heading straight at each other, are often fatal. These can occur when someone travels the wrong way on a roadway because of poor visibility or he or she is intoxicated, impaired, or trying to escape a police pursuit. When one car is involved in an accident, it’s called a single car accident. The driver may lose control, drive off the roadway, and strike other objects such as poles, guardrails, trees, fire hydrants, walls, and pedestrians. These accidents involve many vehicles and normally occur on highways or freeways. These can be deadly accidents and a solid mass of crumpled vehicles makes escape or rescue difficult. If one vehicle catches fire, it can easily spread to others with the help of spilled fuel on the roadway. There could be multiple collisions as vehicles pile onto each other. Drivers and passengers leaving crashed cars could be hit as the collisions continue. Causes could be weather conditions like snow or ice on the road, heavy snow, fog, or smoke that can decrease visibility. Given this confused situation, accident reconstruction can be difficult and liability hard to assess. If you or a loved one have been injured in an auto accident in Georgia, no matter the circumstances, contact Van Sant Law so we can talk about what happened, your injuries, and how to best proceed to obtain compensation. The time to file a legal claim is limited and trying to work directly with an insurance company could be a serious mistake leading to a substantial loss of compensation. Contact Van Sant Law today.